There are, for the most part, only minor differences between the years of the Advanced Design trucks. 1948 Chevy Trucks – A new column shifter was introduced to open up floor space where the floor shifter used to be. Serial numbers codes used as follows: FP 1/2 ton, FR 3/4 ton, & FS 1 ton. Early 1949 Chevy Trucks – Gas tanks were now mounted in the cab behind the seat. Gas filler necks were on the passenger side of the cab by the door handle. New serial number codes used as follows: GP 1/2 ton, GR 3/4 ton, & GS 1 ton. 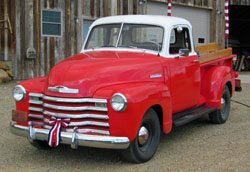 Late 1949 Chevy Trucks – Hood side emblems no longer read “Thriftmaster” or “Loadmaster”, but are now numbers that designate cargo capacity: 3100 for 1/2 ton, 3600 for 3/4 ton & 3800 for 1 ton. Serial number codes remain the same as on early 1949. 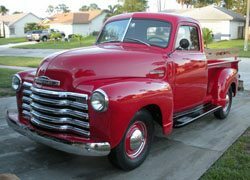 1950 Chevy Trucks – Modern tube type shocks replaced the lever-action type. 1950 is the last year for a driver’s side cab mounted cowl vent. New serial number codes as follows: HP 1/2 ton, HR 3/4 ton, & HS 1 ton. 1951 Chevy Trucks – Vent wing windows were added to the doors to help cool the cab rather than the cab cowl vent. Beds started using 8 boards in the bed mid year. Previous years used 9 boards. Some chrome knobs were added: window handle knobs and chrome wiper knob. New serial number codes as follows: JP 1/2 ton, JR 3/4 ton, & JS 1 ton. 1952 Chevy Trucks – The twist style handles were changed to the push button style. Speedometers now read up to 90 mph. Dashboard trim is painted as opposed to previous chrome. Halfway through the year, Chevrolet stopped using the 3100, 3600, 3800 etc. designation on the hood. They also started installing maroon window and wiper knobs rather than chrome. New serial number codes as follows: KP 1/2 ton, KR 3/4 ton, & KS 1 ton. 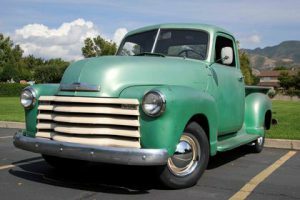 1953 Chevy Trucks – 1953 was the last year for the 216 in line 6 cylinder. Hood side emblems now only read 3100, 3600, 3800, 4400, or 6400. Previous year door ID plates were black with silver letters. 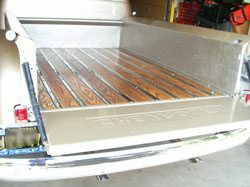 1953 Chevy truck door ID plates were blue with silver letters. 1953 was the last year to use wooden blocks as bed supports. New serial number codes are as follows: H 1/2 ton, J 3/4 ton, & L 1 ton. 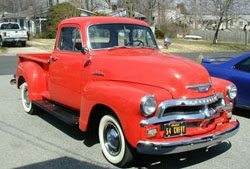 1954 Chevy Trucks – 1954 saw major design changes. A new 1 piece curved windshield was introduced. Both the dashboard and steering wheel were redesigned. Rectangular taillights were replaced with round lights. The biggest change was the “bull nose” grille that replaced the 5 slat grille. A 235 cu inch straight 6 replaced the 216. Serial number codes remained the same from 1953. An optional Hydramatic automatic transmission was available. 1955 First Series Chevy Trucks – Most of the 54 Chevy was retained for 55. 55 Chevy trucks had redesigned hood-side emblems and a modern open driveshaft in place of an enclosed torque tube. Serial number codes unchanged from 1953 and 1954.